NEW YORK, NEW YORK – Sustainable genocide and mass atrocity prevention starts at home—a fact that drives our work within the United States. AIPR’s first U.S. program was the U.S. Military edition of our Raphael Lemkin Seminar. In 2010 and 2011, the Auschwitz Institute brought mid-ranking officers from the U.S. Army Command and General Staff College at Fort Leavenworth, Kansas, to Oswiecim, Poland, for one week of education in preventing mass atrocities and protecting civilians during military operations. Today, AIPR is engaged with the U.S. military and USAID in building the capacity of the Atrocities Prevention Board—the United States’ national mechanism devoted to prevention. In addition to working directly with the U.S. government, our activities within the United States also have a public component. For example, Director of Communications Mike Otterman and Coordinator of the Office of the Executive Director Jack Mayerhofer discussed AIPR’s work in prevention at an event at the Richard Stockton College of New Jersey on October 29, 2014. And on November 5, 2014, AIPR co-organized an assembly at The Spence School—a private, all-girls school in Manhattan—to provide students with information about the Atrocities Prevention Board plus our programs and mission. 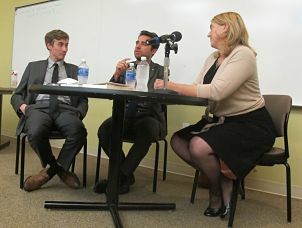 This event, Preventing the Next Genocide: Learning from the Past, featured AIPR Director of Policy and Planning Samantha Capicotto, Jacqueline Murekatete, a human rights activist and a survivor of the 1994 Rwandan Genocide, and Blanca Andrei, a Spence Senior. “We should be diligent and understand the indicators of genocide and mass atrocities,” said Mrs. Capicotto to the more than 75 students in attendance. “We can foresee the processes that can lead to violence—and we can stop them,” she added. In October 2014, AIPR co-organized two Manhattan workshops for educators and museum staff on the memorialization of traumatic history. The first workshop, co-organized with the National Museum of the American Indian (NMAI) and Facing History & Ourselves, took place on October 30, 2014, and welcomed more than 25 New York City public school teachers, plus representatives from downtown Manhattan museums and cultural institutions, who engaged in a hands-on exercise on the construction of a traditional memorial or monument to historical events of trauma. The exercise was led by AIPR Academic Director James Waller and David Schwartz of Facing History and Ourselves. 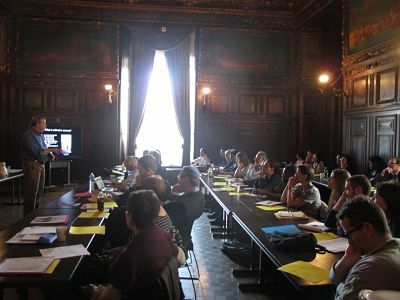 The next day, on October 31, 2014, AIPR held a follow-up workshop exclusively for representatives of downtown Manhattan museums and institutions. 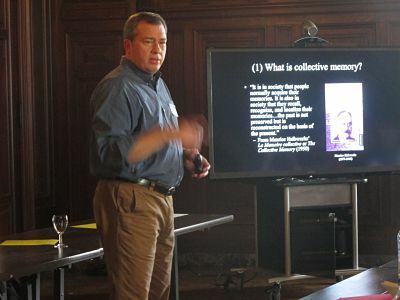 This workshop, led by Dr. Waller and co-organized with NMAI, addressed how our interpretations of the past influence, and are influenced by, collective memory and trauma, and the role that museums and cultural organizations have towards helping the public, and students in particular, understand how we locate traumatic events in our memory. Domestic work in prevention has a long tradition at AIPR. In 2011, the Auschwitz Institute partnered with the Center for the Study of Genocide, Conflict Resolution, and Human Rights at Rutgers University in Newark, New Jersey, to create an undergraduate course in genocide prevention, taught by Professor Alex Hinton as an upper-level anthropology class. In 2013, we co-organized the conference, Deconstructing Prevention: The Theory, Policy, and Practice of Genocide and Mass Atrocity Prevention, with the Cardozo Law Program in Holocaust, Genocide, and Human Rights Studies. The event was held at the Cardozo School of Law in New York City and featured Lt. Gen. (ret) Roméo Dallaire as the keynote speaker and panel discussions on topics including transitional justice, crisis mapping, and national mechanisms devoted to prevention. The conference resulted in an edited volume on the field of genocide prevention, to be published in 2015 by Cambridge University Press.